​We are always looking for nonprofits and individuals to partner and/or collaborate on projects. We encourage helpers or collaborators in many areas, for example grant writing, African continent-based NGOs. individuals with affiliations to school communities, and more. See examples of current partnerships below. CAV wouldn't be where we are today without the help of these local, national, and international organizations. ​Amazon donates 0.5% of the price of your eligible AmazonSmile purchases to the charitable organization of your choice, at no cost to you. Support Compassion for African Villages by starting your shopping at smile.amazon.com. Children's Peace Initiative Kenya (CPI - KENYA) is a community based organization dedicated to promote peace through children. It is an organization that strives to empower socially and economically children living among communities affected by inter-ethnic conflict to develop positive values and attitudes that will enable them to appreciate peace and become agents of reconciliation between their communities as they grow up. The Foundation for Women is a nonprofit organization dedicated to the support of women in poverty. We administer microfinance loans to help women start businesses, educate themselves and their children, and create a new life for themselves and their families. We also support community-based educational initiatives. The Foundation has created and implemented microfinance programs in India, Zambia, Niger and San Diego. 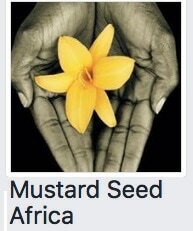 Mustard Seed Africa is a nonprofit organization based in Zimbabwe that works with women at the grassroots level to help them earn an income. We also focus on capacity building for micro entrepreneurs and social development initiatives. Income-generating activities for women include handcrafts, agriculture and entrepreneurship to ensure social and economic empowerment. Orphan Cry shares the hope of God's love with orphan children, and those who care for them, around the world. In addition to our orphan related support, we often conduct needed humanitarian projects within the communities we serve. Our activities are mainly concentrated in Liberia, West Africa, and the Russian Federation. Founded in 2014, Rise and Shine Colorado Foundation works to support Pastor Rose Madumba's organization Rise and Shine, in Zimbabwe, and to help AIDS orphans in their school in Chilimanzi. This organization, founded in honor of slain school principal Robert Massaquoi, works to expand and promote education in the poorer regions of Liberia. Especially needed are books and textbooks, notebooks, pens, pencils, used computers, or other educational electronics. United Way of San Diego County works to help San Diego’s children and families grow stronger. Its mission is to spark breakthrough community action that elevates every child and family toward a brighter future.